Known for their bright blue feathers, red and yellow beaks and loud calls, the great blue turaco (Corythaeola cristata) is native to the forests of central and west Africa. It is the most widespread of the 23 turaco species, with habitats ranging from Sierra Leone to Uganda. Though they are not strong fliers, great blue turacos are able to move nimbly through the rainforest canopy and spend most of their time perched in trees. Great blue turacos are currently classified by the IUCN as a species of “Least Concern,” though it is threatened by hunting and deforestation in some areas. By studying a species of least concern, the Zoo is not only able to develop proactive programs for great blue turacos, but also apply our research to more at-risk turaco species with similar diets and habitats. 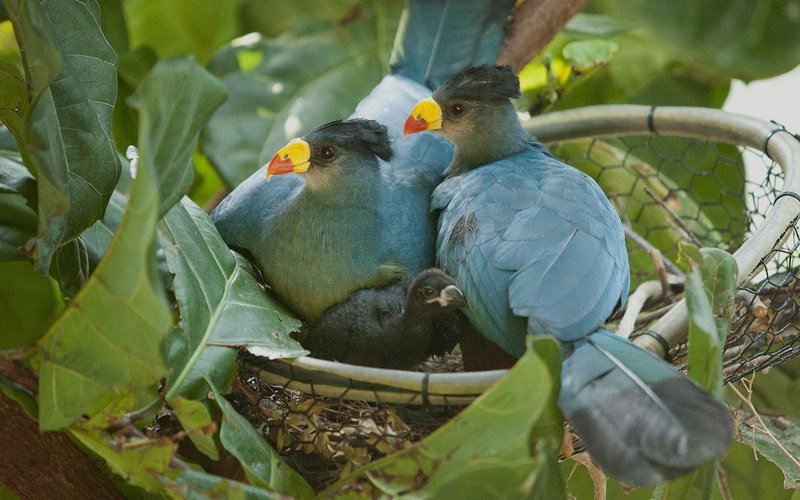 Nashville Zoo is a proud participant in the Great Blue Turaco Species Survival Plan (SSP) and a leader in great blue turaco breeding and husbandry, consulting with institutions across America, Europe and Singapore in order to improve their hand-rearing protocols and increase breeding success. 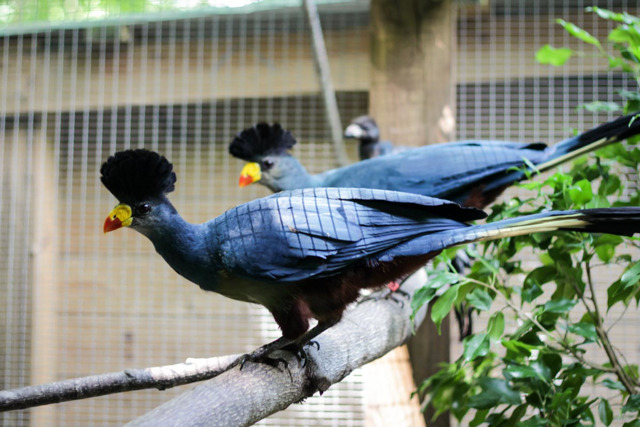 The Zoo’s first pair of great blue turacos arrived in Nashville in 2009. In 2011, Nashville Zoo became the fifth zoo in the United States to successfully breed great blue turacos. Outside of Nashville, only a handful of zoos breed turacos due to the long history of challenges involved in captive breeding of the species. In the wild, turaco parents feed chicks a very specific diet that is not easy to replicate in captivity. At Nashville Zoo, great blue turacos are fed a diet of fresh fruits, leaf material and various sources of protein to imitate their diet in the wild. Additionally, great blue turacos typically build flimsy nests that can leave eggs at risk of rolling out or falling if the nest collapses. The Zoo’s avian staff builds stronger, alternative nest sites for the birds to minimize the risk of losing eggs. In order to increase chick survivability, Nashville Zoo began hand-rearing chicks in 2013 and saw some success. In 2016, the Zoo altered the existing protocols to introduce co-parenting. In this case, co-parenting means chicks remain with and are raised by parents, but staff maintains access to nests in order to monitor the chick’s health, supplement feeding or administer medication. Since introducing co-parenting, the Zoo has seen a dramatic increase in chick survivability rate from 35% to 79%. 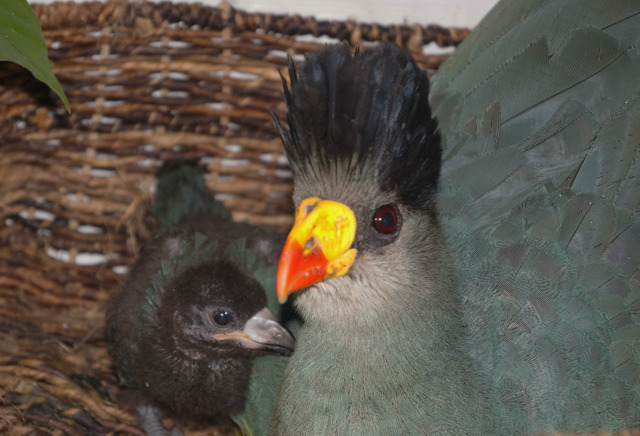 In 2018, the Zoo hatched its 15th great blue turaco chick. Turacos born and raised at the Zoo are living at nine other AZA-accredited zoos in the United States.